Some days nothing but the homiest of cooking will satisfy, and the old favorites beckon. If you’re already going down that less than healthy path it may as well be done in good form and with the best of ingredients. 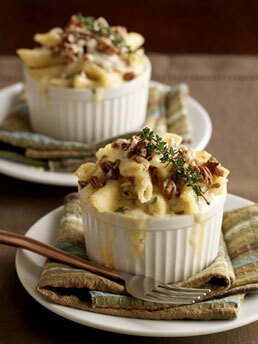 Here is a recipe for a wonderfully rich and decadent macaroni and cheese dish. It adds smoky bacon, roasted shallots, and a little truffle oil to sharp cheddar and Parmesan cheeses. As an added bonus, it can be made up to three days ahead of time. Here, it is cooked and served in individual ramekins. This is adapted from a Tillamook recipe from Brenden Mesch. Make topping: combine crumbs, butter and 1/2 cup cheese. Set aside. Cook pasta according to package directions, drain and transfer to large bowl. Toss with truffle oil and set aside. Prepare sauce while pasta is cooking: Heat olive oil and cook bacon until golden, 3 to 4 minutes. Stir in shallots, garlic and thyme, cook for 1 additional minute. Make roux by whisking in flour and cook an additional 3minutes, whisking constantly. Gradually add half and half, whisking constantly and bring just to a boil. Reduce heat, stirring occasionally, and simmer until, thickened, about five more minutes. Add salt, pepper and remaining cheese. Stir until cheese melts. Remove from heat and combine with pasta and basil. Fill baking dish or ramekins, top with crumbs, and cover. Store in refrigerator for up to three days. Bake at 350 for 15 to 20 minutes or until bubbly. This entry was posted in pasta and tagged cheese, comfort food, macaroni and cheese, truffle oil. Bookmark the permalink.